Great article! 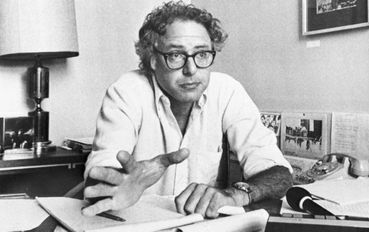 Very interesting article for those who are not familiar with Bernie's early years in public service. A big shout out to Robert B for the link to this post in The Nation. The US needs Bernie in the White House to get things rolling in the right direction. If you can carry out duties on a smaller scale, without alienating too many folks, the chances are you can replicate that on a larger scale. Noted. He has always been a trailblazer and that's why we need him in the White House. Thank you Lynn. Thank you for sharing. He really has great things to say! Thanks Lynn--Bernie would make a fab president. Bernie is one to try to find the solution that works well and fairly for all the people concerned. He is time tested and as an Independent he receives both Parties votes as well as the Independents. As he said, don't underestimate in him his ability to do well. I'm already a Bernie fan...... this supports my opinion! Noted. Thanks so much for posting, Lynn. Excellent article that I wish every single American could read. It would truly open their eyes, and we would have Pres. Bernie Sanders. Signed petition Dandelion posted, too. See, Rick Perry ain’t so dumb! --Whaddaya mean, he was talking about himself? No, no, that’d be STUPID! Rick Perry can’t be STUPID, look at him, he’s wearing glasses and everything! --Okay, yeah, you got me, he’s an idiot. I'm voting for Bernie, and this article confirmed all the good reasons why. Now, how do we get the masses to actually read/learn about the candidates, and then vote? Hmmmmm. A Sanders/Warren ticket sounds real good to me. Noted and signed the "break up the too big to fail banks" petition. Thanks Lynn. Sanders and Warren should serve as Co-Presidents of our beleaguered country. However, if Bernie wins the nomination, I will be more than fine with that! Thanks for letting me know about this article Lynn :).